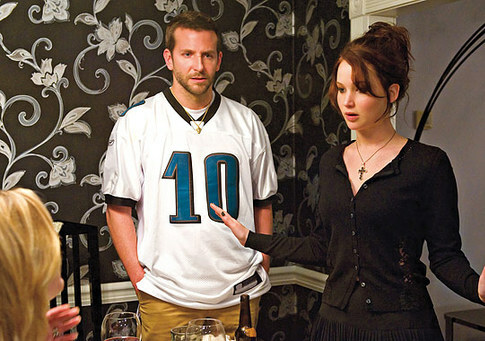 This delightful comedy/drama was written and directed by David O. Russell, adapted from the book The Silver Linings Playbook by Matthew Quick. Centered around two quirky people, both at a crossroads in their lives, the film presents bi-polar disorder as a condition that can be overcome. Pat Solatano, Jr. (Bradley Cooper), a former high school teacher, is held in a Baltimore psychiatric hospital for an episode in which he beat another teacher after finding him in the shower with his wife Nikki (Brea Bee). After serving his court-ordered eight months, his mother Dolores (Jacki Weaver) gets him out. In the parking lot, a fellow inmate, Danny (Chris Tucker) jumps in the car, announcing that he has been released, too, but Dolores gets a call from the hospital asking that Danny be returned. Arguing with his mother, Pat grabs the steering wheel and almost gets them in an accident. Returning home, Pat stops by the library to pick up all of the books in Nikki’s literature syllabus, intending to read all of the books. He is determined that their marriage can be saved, even though Nikki has moved and taken out a restraining order against him. Pat’s father, Pat, Sr. (Robert De Niro) has recently lost his job and is supporting the family working as a bookie, although he intends to open a restaurant so that he can look legitimate. Family and neighbors are all passionate Philiadelphia Eagles fans and Pat, Sr. is hopelessly superstitious about wearing the right jersey, putting his remote controls in certain positions, and rubbing a green handkerchief so that the can bring good luck, “juju” to the Eagles. He also has a temper and is barred from actually attending Eagles games because of his violent behavior. His friend, Randy (Paul Herman), is a Cowboys fan and tries to make money in bets off of Pat, Sr. by gaoding him into making foolish bets. Pat stays up all night reading Ernest Hemmingway’s novel A Farewell to Arms and then blows up at 4 AM because it doesn’t have a happy ending. He throws the book out the window and harangues his parents. Pat believes that the key to overcoming his illness is to find a silver linings in his every day life. He tries to live by the motto Excelsior (ever upwards) and shares this vision with his therapist, Dr. Cliff Patel (Anupam Kher), who replies that he must get a strategy to live with his illness. His friend, Ronnie (John Ortiz), invites him to a Sunday dinner. Married to a beautiful girl, Veronica (Julia Stiles), and with a baby, Ronnie is a broker who is suffering anxiety from fluctuations in the market. Veronica’s sister, Tiffany (Jennifer Lawrence), whose cop husband was recently killed, shows up at the dinner and she and Pat find that they can talk about their various medications. Tiffany agrees to deliver a letter to Nikki if Pat will dance with her in a competition and he reluctantly agrees. They begin to rehearse, but the dance competition takes on a new meaning when Pat, Sr. and Randy make a parlay bet that the Eagles will beat the Cowboys and that Tiffany and Pat can score at least a 5 in the dance competition. The story is completely engaging. Even though the film runs nearly two hours, every single moment is compelling and one doesn’t notice the time. Cooper and Lawrence are both really terrific, portraying characters that are complicated and yet disarmingly simple. Lawrence won Best Actress for her role as Tiffany. DeNiro is at his very best as Pat, Sr. and Jacki Weaver gives wonderfully believable and warming performance as Dolores. All of the supporting cast are terrific. Russell’s script and direction are spot on. The editing is amazing, as is the use of music and sound. It is a movie that deserved all of its nominations and it should be seen by everyone. It is funny, full of pathos, and very moving.